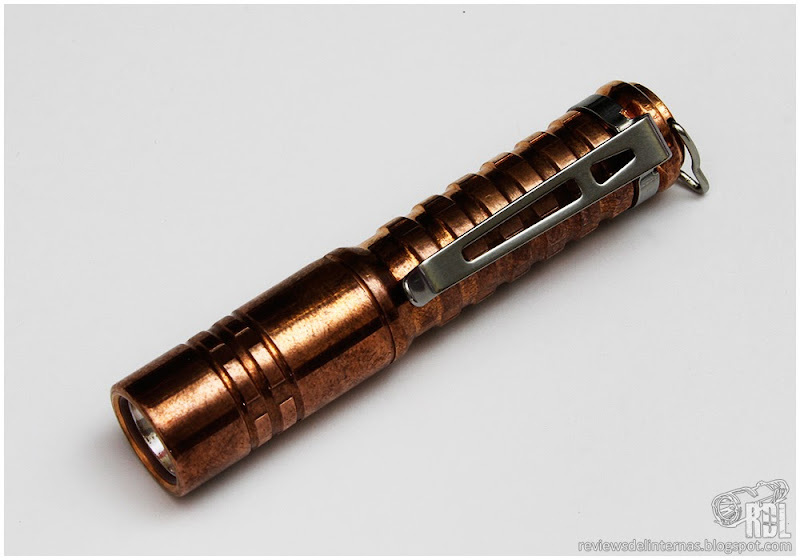 One of the new torches that Massdrop platform is offering is the ReyLight Copper Pineapple, a compact, copper-machined AAA torch with a rather original look. 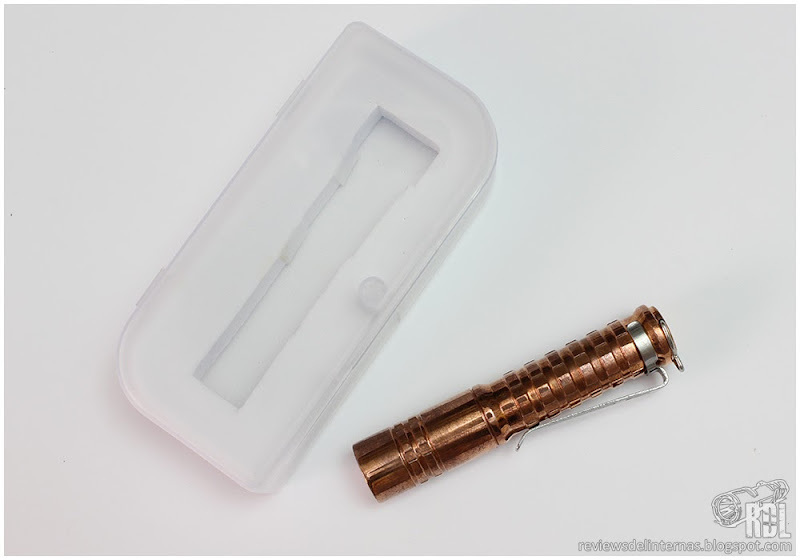 The flashlight comes in a plastic box, identical to the one we saw in the Massdrop Brass AAA, also used by some well-known manufacturers such as Lumintop or Ultratac. 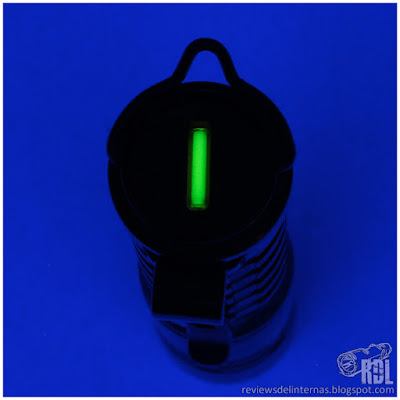 NOTE: As it is a sample that has been previously used before reaching my hands, the flashlight shows the first signs of patina formation on its surface. The ordered units will arrive preserved from oxygen and moisture in an airtight plastic bag. 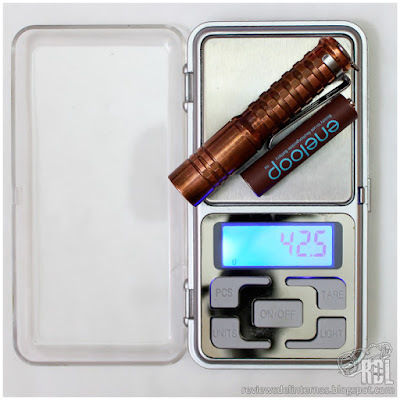 Included with the flashlight are a couple of spare o-rings, and the pocket clip for the flashlight. 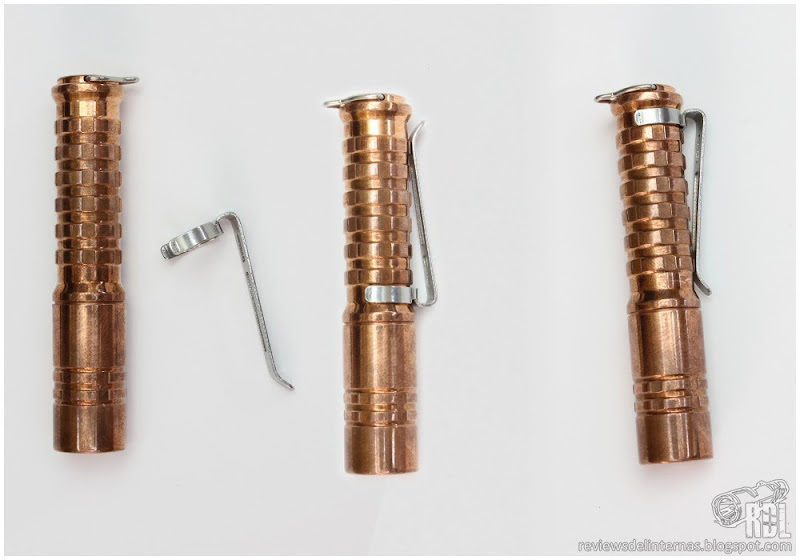 Externally, the flashlight is certainly peculiar. Completely finished in copper, the ReyLight Copper Pineapple has a peculiar machining, and according to the manufacturer’s comments its knurling resembles that of a pineapple, hence its nickname. 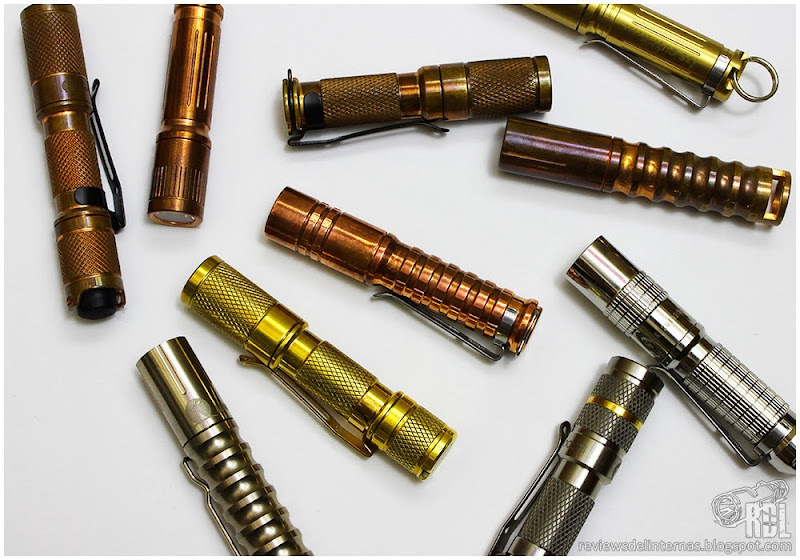 Being such a heavy metal, the flashlight feels heavy in the hand, a feeling that differs from typical anodized aluminum flashlights. 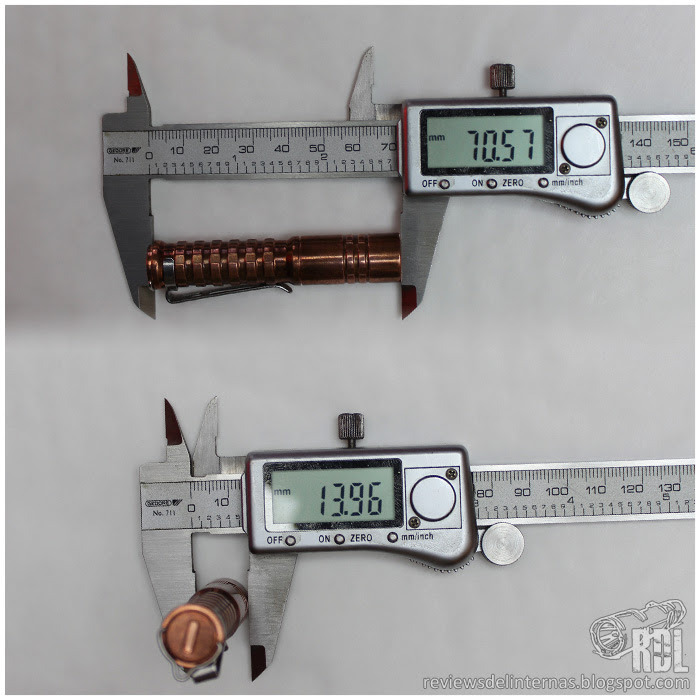 The total weight is around 30g (40 with AAA battery), body diammeter is 14mm and total length is 70mm. The torch optics consists of an AR glass lens, rugged reflector and a Nichia 219C neutral tinted LED correctly centered. 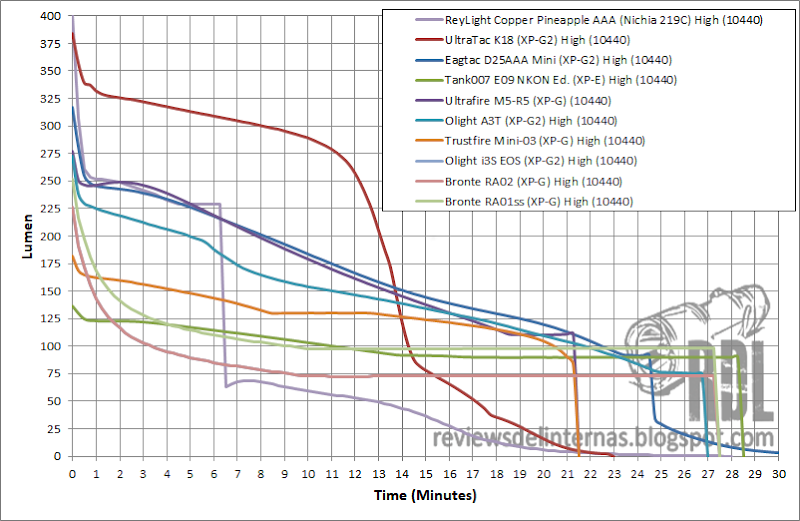 The dimensions and geometry of the reflector are very similar (if not identical) to those found in the K18-A5 family of Ultratac, which at the same time are quite similar to the Lumintop Worm-Tool. 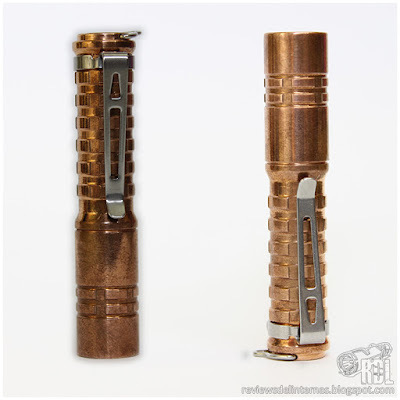 The clip is pressed against the flashlight body. The body is equipped with two tracks to hold the clip in opposite directions. The same clip can be found in the Ultratac K18. 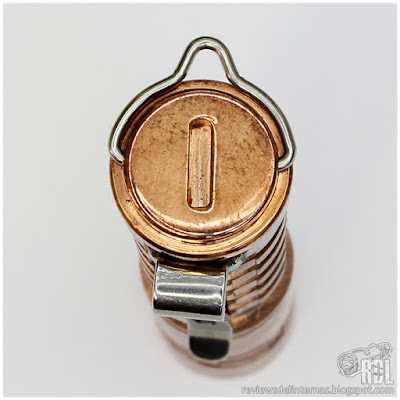 The threads are properly machined and run smoothly. 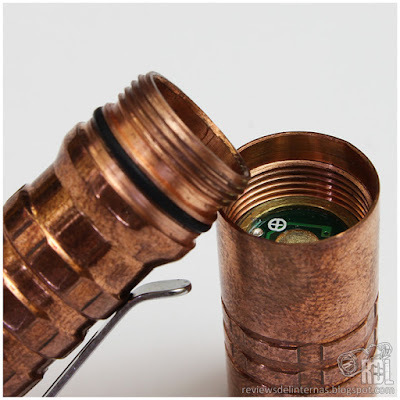 Thanks to the knurled head track, the torch can be operated with one hand without any problems. The tailcap design is reminiscent of the one we saw in the Ultratac K18 v2017, with a folding hanger that will allow us to place the torch in tailstand and at the same time offers us a very comfortable anchorage point. 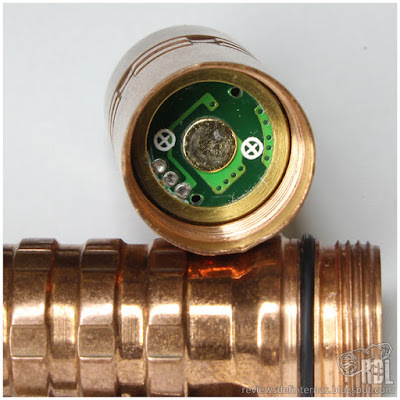 At the base of the tailcap we will find a slot to optionally install a 6 × 1.5mm tritium vial. 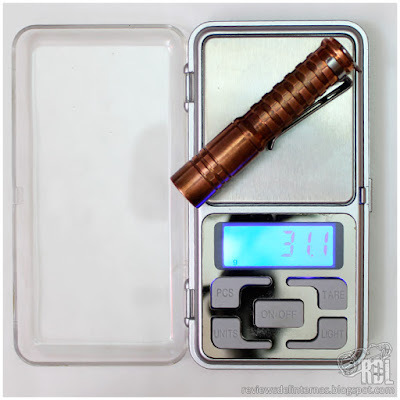 The dimensions of the slot allow to install a vial of DQG SPY-FAIRY, so locating a vial will not be a problem if we decide to install it. 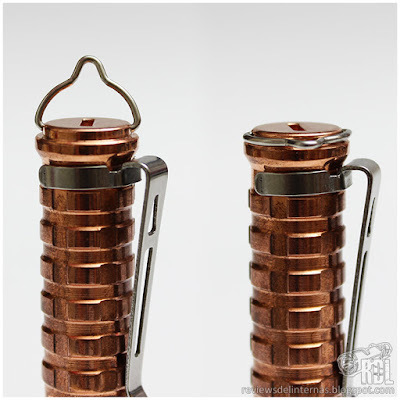 The ReyLight Copper Pineapple is a twisty flashlight with a three-mode user interface and no memory mode, so that the flashlight always turns on in the lowest mode. 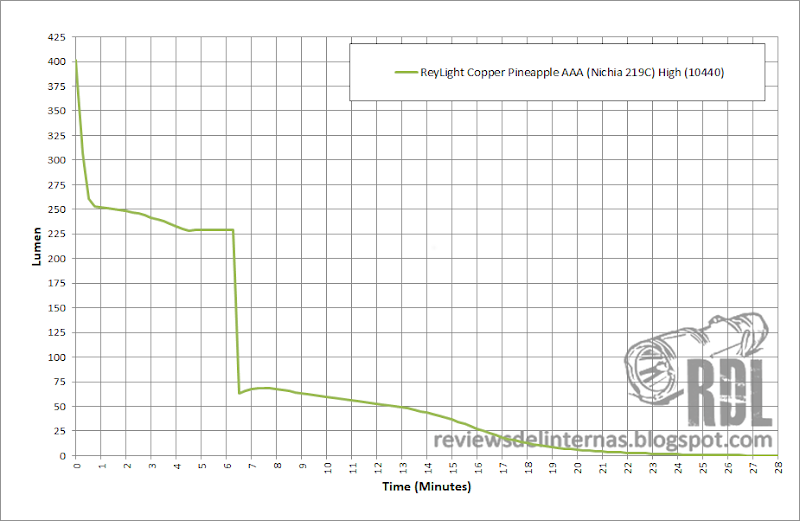 Power On/Off: ReyLight Copper Pineapple is turned on and off by threading or unscrewing the head. 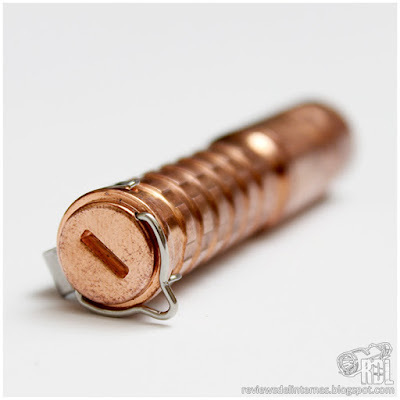 With the head screwed in, the flashlight turns on, with the head slightly unscrewed the flashlight turns off. Switching modes: To switch between the different modes, with the light on, we have to switch off the flashlight momentarily and then switch it on again in the next 3 seconds, when the flashlight will switch on as follows. The order is ascending: L->M->H. Memory: The flashlight lacks memory mode, so after 3 seconds from its switch-off it always switches on by default in Low mode. With a NiMH the flashlight shows an uneven discharge curve, although considering the initial output this behavior is surely due to the high demand of the circuit. 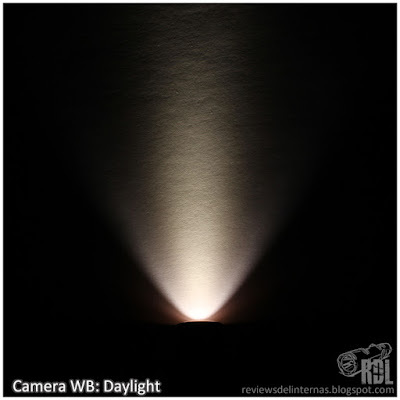 In the medium mode, with almost 16 real lumens, the flashlight behaves very differently, with a completely flat regulation for almost 5 hours that has maintained the regulation. 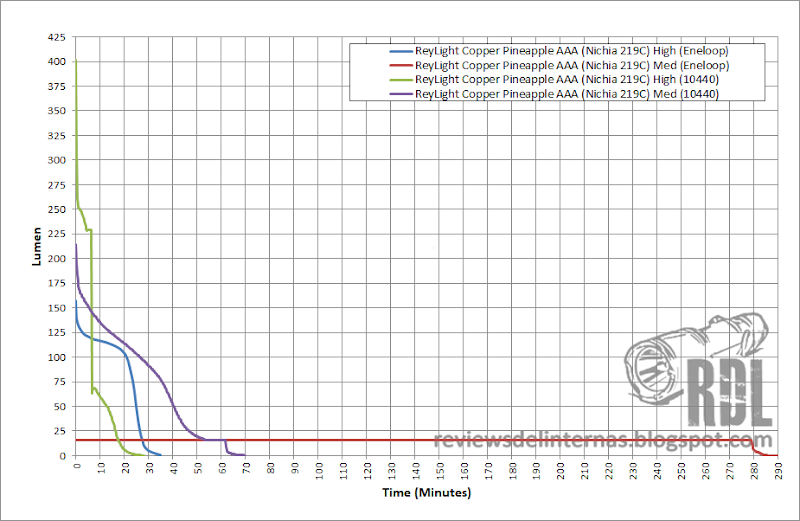 With a 10440 the initial output exceeds the actual 400lm, but falls quickly stabilizing slightly above 250lm, to then enter a kind of flat regulation phase around 225lm. 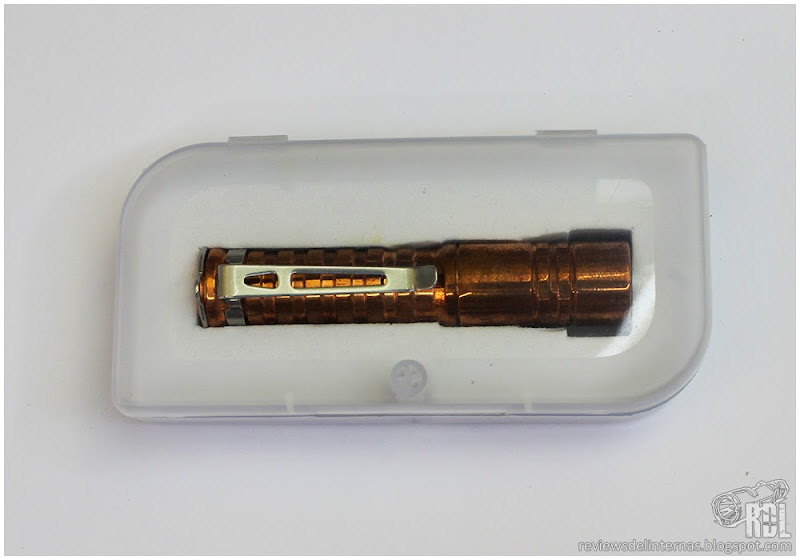 Shortly after 6 minutes, the flashlight loses this regulation and falls, to continue for a few minutes in an unregulated manner, gradually decreasing its output gradually becoming switched off shortly before the half-hour of continuous use, leaving the battery below 2V. The medium mode with 10440 is more contained, and shows a complete lack of regulation. 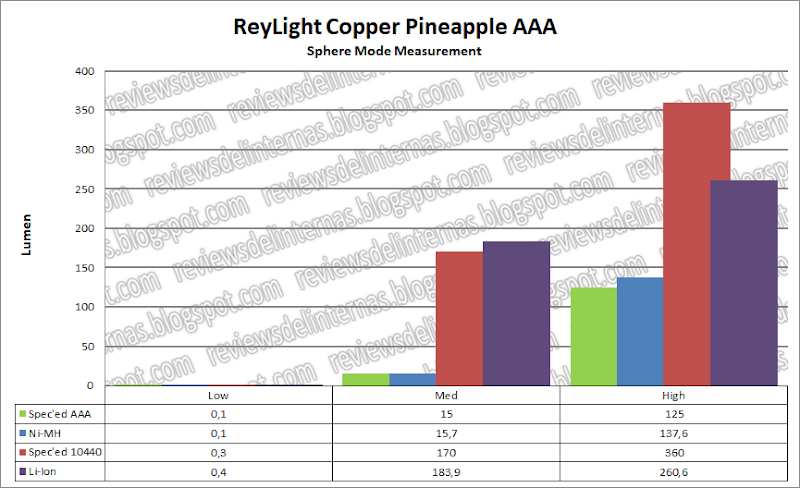 Compared to other commercial flashlights, the ReyLight Pineapple stands out for its high initial output with Eneloop, although it lags behind in efficiency. The performance with 10440 is upgradeable. 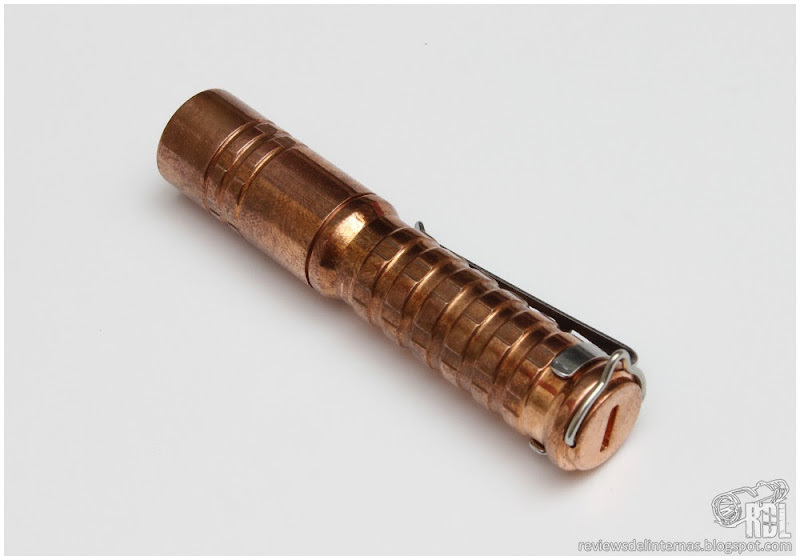 Although the optics of this torch are already well known to most people, the main attraction is the LED emitter used. 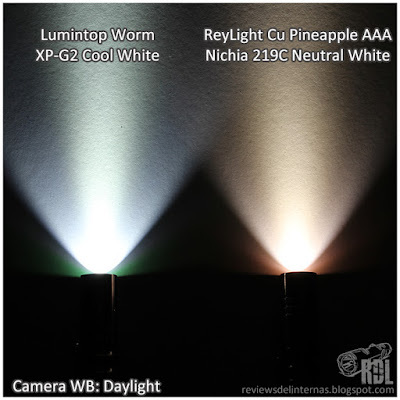 Instead of the typical CREE XP-G2 the ReyLight employs a Nichia 219C, which with a neutral-tone pulling-slightly-to-warm offers a truly pleasant illumination. We have a medium-large hotspot that blends smoothly with the spill, with complete absence of rings or artifacts. The chromatic difference in the color difference in the photos is due to the way my camera’s white balance (in auto to minimize the dyeing effect) has interpreted the light tone as a function of shutter speed. 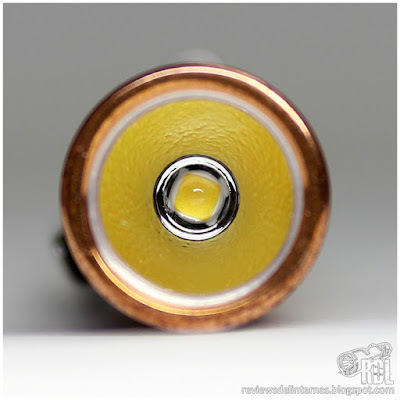 The tintof the Japanese LED emitter is simply a delight, and I would say that its color temperature is between 4000K and 4500K. 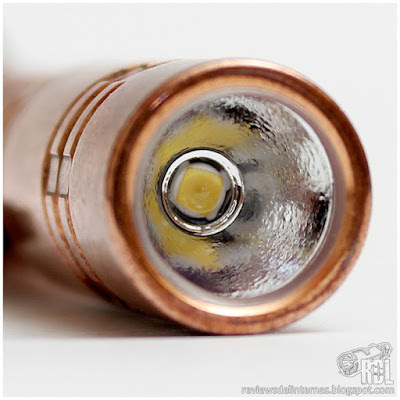 It’s a good idea in my opinion to have used this LED with this tone as opposed to cheap alternatives like the green XP-G2 that is so widespread among today’s flashlights. 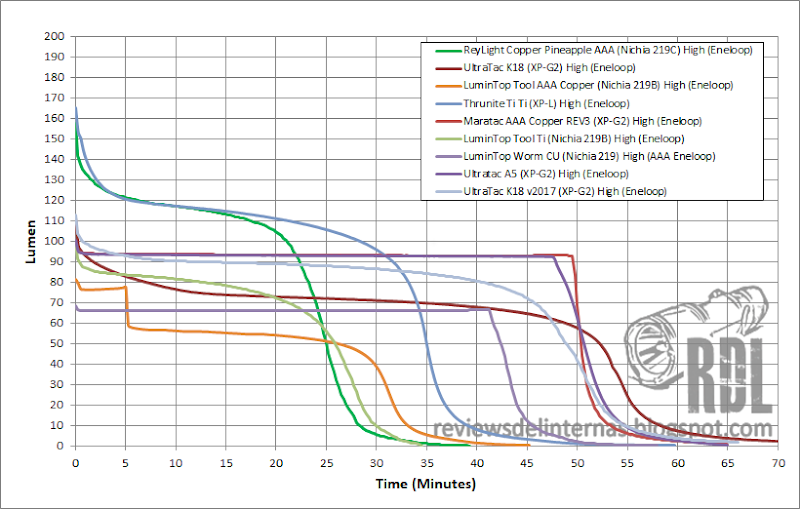 Beam geometry is practically common with the Worm, Tool, K18 and A5. 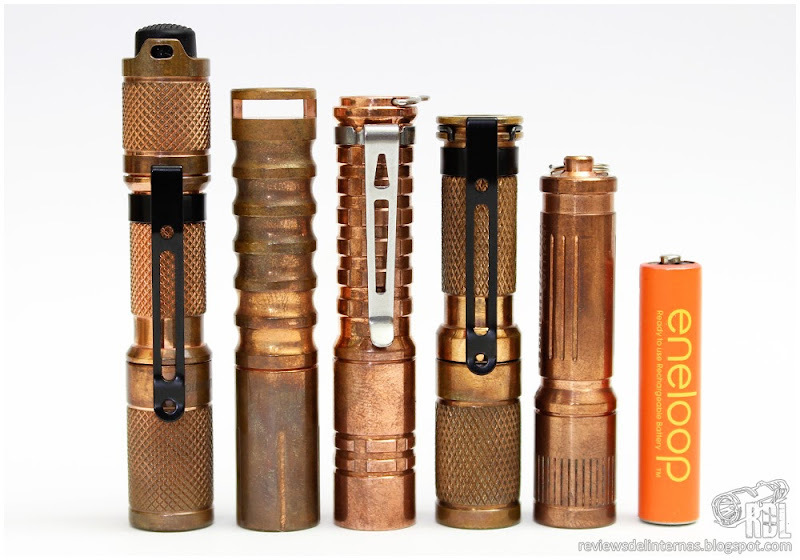 Massdrop is specializing in offering a good handful of unique flashlights, with finishes in rare materials or exclusive details at prices more than contents. 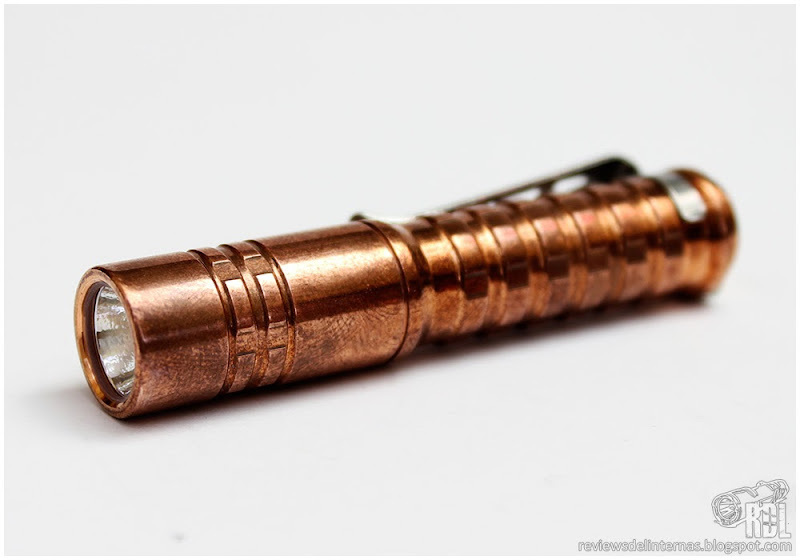 This ReyLight is a good example of this: Copper flashlight, exclusive machining, Nichia 219C, AAA compatible and 10440 compatible, optional tritium slot… all for an affordable price. 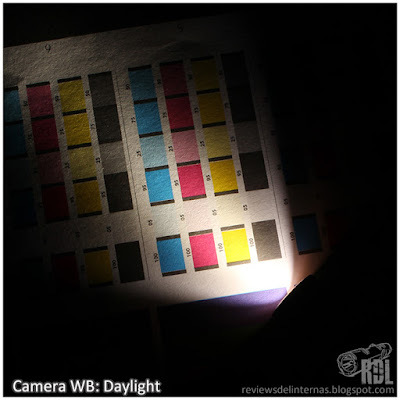 Negative aspects: It is always a discussion whether the order of modes should be ascending or descending, whether a “sub-lumen” mode can be considered as low, or whether a flashlight intended for EDC use on a key fob or not have memory… They are all personal tastes or preferences that each person has… I personally would have preferred that the lowest mode, in this case sub-lumen, would have been second in the sequence of modes. Simply because its 0.1lm is insufficient for 99% of the time, and forces me to turn on/off/on to access the middle mode. 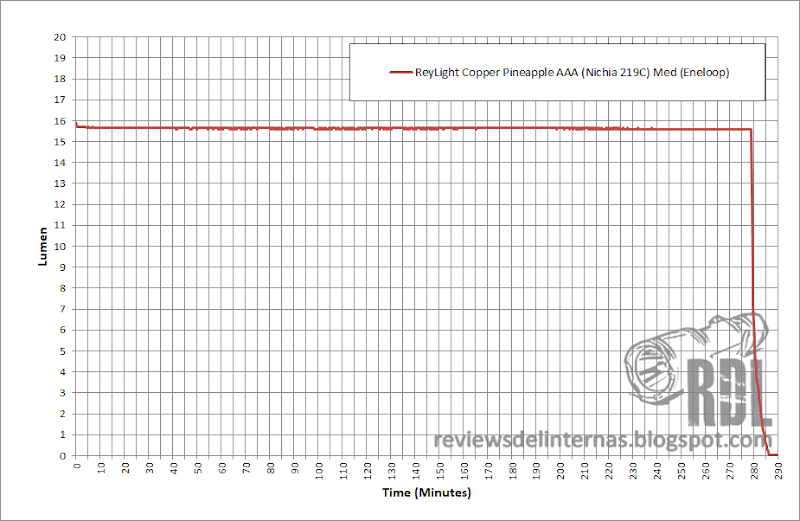 Positive aspects: The ReyLight Copper Pineapple AAA has left me a very good taste in the mouth thanks to the combination of a very original machining, the use of an LED with a great dye and the regulation that allows us to use 10440 in addition to AAA are, in my modest opinion, the best values of this flashlight. 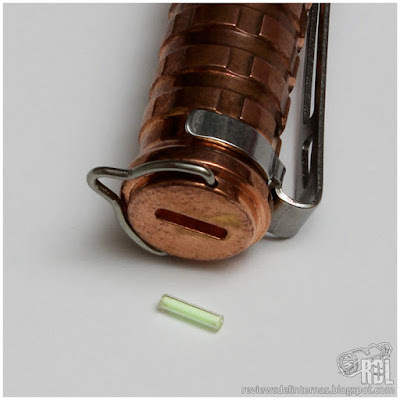 I really liked the fact that the tritium slot has been machined, but the final decision was left to the user because these small vials, although less and less, are usually expensive and make the final set more expensive. 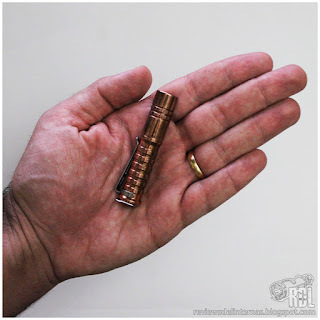 ReyLight Copper Pineapple AAA Flashlight provided by Massdrop for test & review. Thank you! Nice review, thanks! Beautiful pictures too. I love copper patina. Mine hasn’t come yet but I was in the drop. Looking forward to it. OOh, I like it. Anyone wanna trade a brass for a copper pineapple? Thank you, very nice review. Very useful review. I just ordered a Reylight pineapple. What’s the CRI value of the 219C ? Definitely recommend the AAA CU pineapple, nice work Rey!